In one, I’m late: late and lost. Everyone is expecting me, but I can’t find my way out of a maze of locked doors and dead-end hallways. In another, it is exam day. The problem? The class never made it to my schedule, so I didn’t even know that I was registered for it. Now I have to take an exam on material I’ve never seen. In my favorite recurring dream, though, people from all over the world, “children from every nation,” come together in peace. They sing. They laugh. They hold hands. Lifelong friendships form instantly. Differences are dealt with civilly. The world is at peace. It’s a great dream—one that leaves me with a wakeful longing for unity. But this week, my 16 year old daughter is actually living my dream. She is in Nairobi, Kenya attending PassportKenya. At this camp, kids from the US and Kenyan kids, experience true cultural exchange. (Trellace’s roomie is a Kenya native.) All the kids—American & African—are followers of Jesus Christ. This is not an evangelism trip on which middle class suburbanites go into the wild to save the savage tribesmen. It is not a mission trip in the traditional sense; that is, the Westerners did not rush off to a foreign land to offer aid. This is a mission immersion trip: a time for Christians from this country to develop friendships with Christians from that country. They have worshipped together; they have ministered together; they have sung songs together—some in Swahili, some in English. And in so many of the pictures I’ve seen, they are holding hands—white hands and brown, black hands and tan. Peace. Right here on earth. It’s like a dream come true. “You are a child of God and God takes great delight in you. God is giving you everything you need to be the person God is calling you to be." Guy Sayles says those words each time a new believer rises from the baptismal waters. Those of us who attend First Baptist Church of Asheville have heard these phrases many times, but never did they ring truer than they did that day. Cameron is older than his brother Collin by several years. Yet Collin learns at a higher level, and moves with greater ease than his big bro. He’s what the world would call academically and intellectually gifted. 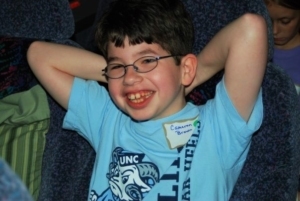 Collin is a delightful child, interacting as easily with kids his age as with the adult friends of his parents. He’s a great kid. And so is Cameron. But Cameron’s words are sometimes hard even for adults to understand; kids his age too often fail to communicate with him at all. His steps are slow, particularly when stairs are involved. Cameron is what the politically correct of the world would call “special.” And they would be right. They would be right in ways they can’t even imagine. Cameron’s smile brightens the world around him. His laugh brings joy to all who hear. His ready hugs can lift the lowest of spirits. Cameron understands love. He knows his family loves him, particularly that precocious little brother who does double duty as Cameron’s best friend. He knows that everyone at his church loves him, especially the little girls in his Bible study class who rush to sit beside him and to hold his hand as he goes up and down steps. And, in a way others will never understand, Cameron knows that Jesus loves him. So Cameron, being Cameron, just loves Jesus right back. Because he is being raised in the Baptist church, part of Cameron’s upbringing has included conversations about making his profession of faith in Jesus Christ. His parents have talked to him about what it means to join the church and have entertained his questions, helping him to understand baptism. Brother Collin had already made his profession of faith privately, but found baptism itself intimidating and therefore hesitated to make his decision public. Not Cameron. Once his mind was made up, it wasn’t long before he stepped right out into that chapel aisle and walked straight to his pastor, letting him and everyone else know that he had chosen to follow Jesus. What’s more, he wanted to confirm his decision by believer’s baptism. Whoa. This would be complicated. Collin had not even been baptized yet and he is not even scared of water like Cameron is. In fact, just getting Cameron into the baptismal pool and back out again posed enough obstacles to discourage the whole idea. But Cameron was determined and his courage inspired Collin who decided he was ready for baptism if Cameron was. “This is something the brothers should do together,” Collin told his mother. Collin went first. Dripping from his dunking, he stepped out of the baptistry. It was Cameron’s turn. The pastor turned to take his hand but Cameron hesitated. (Negotiating stairs is hard enough without water underneath your feet, for goodness sake.) Slowly, he made his way toward Dr. Guy. Within reach, Cameron grasped for his pastor who lifted him into place. Now, most people who are baptized, turn to look at the congregation or gaze toward the pool’s exit. Not Cameron. He turned to face Guy, waiting. Cameron leaned into Guy’s embrace, and after a moment or two, Guy lifted Cameron out of the baptistry, to walk in newness of life. George loves living—cancer or no cancer—and he’s in no hurry to give this life up for the next. George knows where he’s going; he even has a son and a wife there waiting on him. He doesn’t fear leaving here for heaven; it’s not that. It’s just that . . . well, George loves life. He really, really loves life. “Have you met my great-grandchildren? They’re downstairs.” I had not. “Of course Ben and Jocelyn--that's just two of them; you know I have eight?” I did not. “I’ve been so blessed.” George smiled, nodding. “Hey did I tell you? I went to Florida last week.” George's eyes twinkled; he looked like a kid who had pulled a fast one on the adults of the world. George, in the advanced stages of cancer, had been scheduled for surgery last week. By a fortuitous turn of events, the surgery had to be rescheduled for the end of the week; it just so happened that one of his daughters was Florida bound. George loves Florida. “What in the world did you do down there?” I asked him, still shaking my head at the wonder of it. “Mostly what I’m doing right here.” George laughed at himself, gesturing at his comfy set-up. “But it was good just to be near the water.” He sighed, wistful. “You know that’s not like me to sit around.” I knew. In addition to making culinary delights to share, George has countless other hobbies and avocations. He goes to first run movies, art galleries, and the homeless shelter. 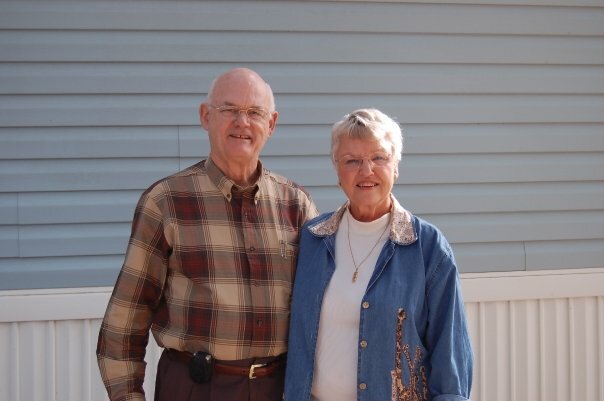 He is an avid fisherman, a woodworker of remarkable talent, and a gardener with a bright green thumb. He reads voraciously, maintains his North Asheville home, and attends Asheville’s First Baptist every Sunday he is able, his time-worn, green-covered Living Bible in hand. And he’s planning even now for a Thanksgiving family reunion when he’ll be surrounded by his children and theirs, and theirs. My octogenarian friend nodded, tears flowing freely now. Racism. It can be so sneaky. I know. Racism snuck up on me and I never saw it coming. There I was, sitting in Jan Davis Tire Store (time to get the tires rotated), minding my own business, when in walks (I kid you not) Osama Bin Laden’s nephew. Olive skinned and bearded, with a pill-box shaped hat perched on his Middle Eastern hair, he wore billowing britches, a flowing blouse that reached his knees, and a long linen vest draped over the whole ensemble. He approached the counter; I didn’t hear what the clerk called him, but I think it was Mr. Bin Laden. Now, it would have been bad enough having a terrorist’s blood kin walk into the place of business I was patronizing had I not been studying (you guessed it) biblical Hebrew, of all things. And I was sitting right by the door, practically in the doorway. So I think to myself, Well now, Osama Bin Laden’s nephew has just walked into Jan Davis Tire Store and I’m sitting in his pathway reading Hebrew. How very nice is that. Well. Hmm. How should I handle this situation since I know I’m not an over-reactive person and I’m certainly not a racist for heaven’s sake! About that time, the fella turns around and before I realize what I’m doing, I smile and say hello (because I smile and say hello to everyone—it’s a habit). He smiles back, says hello, does not pull out a machine gun, and proceeds out the door. Then he stops, noticing my book, and comes back inside the store. “You’re reading Hebrew?” His eyes are kind. Stupid racism! I mentally slap myself for slipping into the stereotypes that are based on the tiniest minority and are so unfair. I know better. But knowing and doing have never been the same. This person is a potential friend, regardless of his religious or political background. Shame on me for missing that, if even for a moment. Ugh! I can't stand racism! Especially when I find it in my own self. “You don’t see many people reading Hebrew in Asheville.” He smiles, chuckles a little. He asks where I go to school and then where Gardner-Webb is and we talk about that for a minute or two. The conversation turns back to Hebrew. “I read Hebrew,” he says, “but only about as well as a third grader.” His countenance is warm, open. “That’s great. I’ll have to learn a lot more to get to the third grade level.” We both laugh a little. “You too,” I say and I really hope that he does. I hope, I pray, that throughout this day, Godly people will treat him the way they would want to be treated. “It was nice meeting you,” I say, and I really mean it. My 11-year-old daughter, Margaret hesitated, seeming to withhold information. Saturday night sleepovers. I don’t much care for them. You see, I want my kids in church with us on Sunday morning and Saturday night sleepovers make that tricky at best. Sure it’s fine to visit church with friends, but I feel like there will be plenty of time for that when they are older. 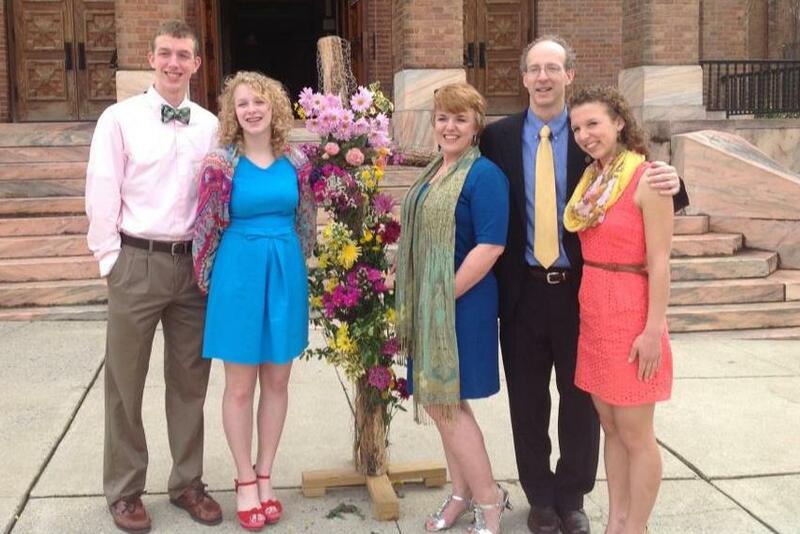 For now, this family goes to church together on Sunday mornings. It's a parenting priority. After we talked about it, Margaret shared our plan with her friend. According to Margaret, it went something like this. Church. Around here, it’s a priority. Published August 29, 2009 when Baker was 13 years old. It’s true. The summer was hard, but there were some amazing, almost miraculous moments. I was able to see those moments, in part, because of a conversation I had with my son towards the end of July. It went something like this. "I do indeed, Baker-boy, I do indeed." Sometimes I pull older posts back up and promote them to new readers. I was about to do that with this four-year-old post, so I thought I would add a picture. I googled "Trailways bus, Georgia, Country roads." In seconds (amazing!) I had pages of photos that matched or almost matched my search criteria. Though I hadn't put the date in the search string, the pictures were mostly illustrating events from the forties, fifties, or sixties. Perfect! Except not really. The top ten or fifteen returns did include buses on country roads; the problem was, each depicted some form of violence: buses burning, riots, people being beaten. Hideous. And from the midst of all that comes this story about my daddy, on a back road in Georgia, riding a Trailways™ bus. It wasn’t something a boy got to do every day you know: taking the Trailways™ bus from his home to his grandparents' place 20 miles away--especially by himself, seeing as he had half a dozen siblings who would have loved to have joined him. But that’s just what my daddy did one Georgia day some decades ago. So back in 1947 (or 1948) Daddy, soaped up and shiny for his special trip, boarded the bus. The bus was nearly full. Back then, segregation was law, and down in the Deep South Jim Crow ruled the buses with at least as much authority as he had in the classrooms. Daddy, belongings in hand, worked his way from the front toward the back of the bus looking for a seat, finally finding an empty one just inside the Whites Only section. He plopped his things down and took his seat. The bus started up again, chugging on toward Daddy’s adventure. In those days, at least in rural Georgia, bus drivers would pull over occasionally to pick up riders. You see, folks needing a ride would wait along the side of the road, and then they’d pay a pro-rated fare for their truncated trip. Daddy looked out the windows, watching the Georgia terrain ease past. In the distance, Daddy could see a woman waiting. A child was with her: a very young child. The woman’s arms full of bundles, she still managed to keep hold of the child’s hand. The bus inched closer. Daddy’s view sharpened. The woman was black. Daddy glanced over his shoulder. The section behind him, the seats designated for this mother and child, were all taken. The bus bumped to a stop. The woman, shifting her load to access her fare while still holding tight to her little one, climbed aboard. As the woman got to his row, Daddy met her eyes. Picking up his things, he slid over to the window seat, leaving the aisle seat free. Her expression hardly changed as she placed her things on the floor, lifted her child into her lap, and took her seat: a seat in the White’s Only section of the bus, a seat given her by my daddy who was just an 11 year old boy (or maybe 12). 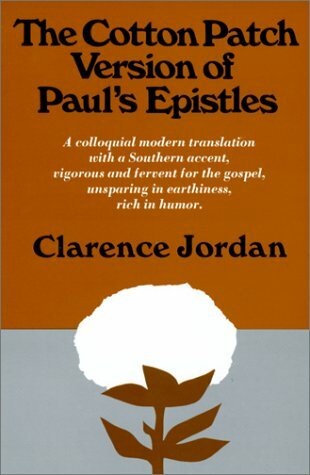 Clarence Jordan (translator of The Cotton Patch Version) is right. I don't know beans about praying. Prayer absolutely blows my mind: God, the creator of the universe, wants to be in communication with me? I really can't grasp that. But I pray anyway. I pray to music. I pray Scripture. And I pray for loved ones. I pray for Barbara and her two boys—their husband and father died suddenly this past January. A friend who has pitiful insurance and horrific health problems. Cathy whose younger brother died way too young leaving a wife and children. Teachers whose salaries have been cut or who have lost their jobs—particularly those among them who are single parents. A loved one in a new job. My nephew-in-love who goes off to college next year and his dad who has Parkinson’s disease. Niece Rachel who is about to start her senior year. My mother-in-law with MD. And then there’s this: my friend Kim who beat breast cancer last year just before her son, now 11, was diagnosed with terminal brain cancer—the same Kim who has just been diagnosed with colon cancer. This week, her son, who was just denied access because of his age to clinical trials that might save his life, will be going to NIH in Maryland to explore further treatment options with his dad (Kim’s husband) while Kim faces her own cancer surgery back in Oklahoma. Yeah, I gotta tell ya. I don't know beans about praying. And when I read that I sigh: a sigh of relief. I sigh because suddenly I remember, I’m not alone. I sigh, I breathe, remembering that Barbara is not alone, and Cathy isn't and neither is my nephew.The Spirit is sighing with me, magnifying those sighs, translating them into words that I can't seem to find, building them into bridges from the hearts of the hurting to the very heart of God. I sigh knowing my Rachel has a bridge and my mother-in-law can cross it too cause this bridge is seriously wheelchair accessible. And I sigh so deep within my spirit, beyond the flood of tears that chokes my heart for a little boy who just wants to play baseball with his brothers and for his mother who wants to watch him. I sigh with relief because as I do, I find that the Spirit is already there. The bridge is already built. The words don’t have to be found. “And God, who searches the heart, knows what is the mind of the Spirit, because the Spirit intercedes” for me. Even though I don’t know beans about praying.